LudoBites 3.0 was no sequel. It was a reboot. Come knowing that and you’d leave happy. But come expecting a sequel to LudoBites 2.0 at Breadbar and you might as well have gone to watch JJ Abrams’ Star Trek reboot expecting to see William Shatner. All the familiar dishes from LudoBites 2.0 were gone, replaced by a completely new line up. Oxtail polenta? Gone. Foie gras croque monsieur? Gone. Ludo Fried Chicken? Well, that one made a comeback in a different form. Kinda like Leonard Nimoy as Spock. 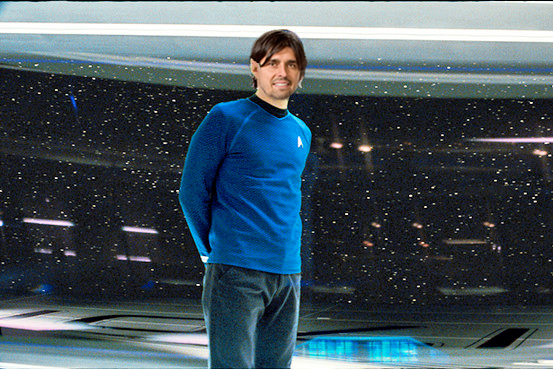 In fact, don’t even come expecting to see Kirk in the captain’s chair. LudoBites 3.0 left the confines of Europe to explore Asia and Mexico. Kimchi, udon, dashi, miso and mole took center stage, befitting the pop-up restaurant’s move to Royal/T, a Japanese cosplay cafe. It’s as if Sulu had taken over the bridge and reprogrammed all the food replicators. But that, really, is the mission statement of LudoBites. It allows Chef Ludo Lefebvre to create and explore cuisines without the normal constraints of running a restaurant. To seek out new tastes and new cultures. To boldly go where no man has gone… okay, perhaps I’m taking this metaphor too far. We went on the second night of the limited 13 night engagement. The menu changed over the course of LB 3.0 but, on this night, Ludo opened with his caramelized curry peanuts. More a snack than a course, these would have been perfect with an Asian beer. A Tiger or a Singha, perhaps. Just something to nibble on before the meal. Next up was the scallops with brown butter, pineapple and squid ink powder. The scallops were fresh and plump, with the pineapple adding a sweet and tart acidity. I did pick up a bitter element though that no one else at my table seemed to detect. I’m guessing this was a function of the squid ink powder. This was followed by the bread soup with poached egg and a gruyere marshmallow. The bread soup had a strong, smoky bacon taste. Delicious but I had been expecting more of a toasted bread flavor from what I had previously read. Luckily, I prefer the taste of bacon to bread. Next was a confit of pork belly with pickled mustard seeds, vadouvan apples and frisee. The pork belly was good. Tender with a firmer skin. The fifth course was the Monterey squid with chorizo oil, kimchee puree and eggplant “paper”. Talk about Korean-Mexican fusion. But the dish worked. The squid was tender with just enough give and, eaten together with the chorizo oil and kimchee puree, brought a complexity to the dish. The dish that followed was, surprisingly, my favorite of the night. Veal udon, kombu dashi, mushrooms and sesame seed miso. I say surprisingly because here was a Japanese-inspired dish prepared by a classically trained French chef. But the veal was tender, the broth flavorful and with depth, and the addition of mushrooms, shallots and the sesame seed miso complemented but never interfered with the main flavor palette of veal and dashi. Perhaps I shouldn’t have been surprised. After all, this dish probably best exemplified LB 3.0 – a French experimental pop-up in a Japanese neo-pop cafe. In contrast, the next dish was exactly the kind of dish I’d expect from Chef Ludo. The foie gras beignet with yellow celery root remoulade. I read Ludo’s tweet about this dish on his recent trip to France and knew I’d taste it sometime on his menu. And, after all, what is LudoBites without some foie gras? This dish tasted exactly as I had imagined. The salty, offally, fatty, almost melted foie gras paired with the sweet fried goodness of the beignet. This dish should go into the LudoBites Hall of Fame along with the foie gras croque monsieur, oxtail polenta, Ludo Fried Chicken and caviar panna cotta. Next up was the wild striped bass, garden vegetables and yuzu aioli. The bass was well cooked and the vegetables certainly colorful but my mind was still on the veal udon and foie gras beignet. The marinated hanger steak with crunchy escargot, baby corn, bok choy and black olive mole followed. Here was another dish I liked a lot. The hanger steak was nicely pink in the middle and well marinated but it was the mole that Chef Ludo had only learned to make a few weeks ago that stood out for me. Okay, I’m no expert in regional moles but the fact that Teenage Glutster’s mom (who Ludo learned the recipe from) gave it her seal of approval was as good a sign of authenticity as any. Yes, he added his own touches but the slight sweetness of the complex mole was a perfect accompaniment to the hanger steak. The baby corn still in the husk was a nice touch and made for a beautiful plate. The crunchy escargot were more for texture than taste, I think. Honestly, I felt they were extraneous but they did add a nice textural contrast when eaten with the steak in the same bite. The traditional cheese course was replaced by the Fourme d’Ambert tourte with red pear and a honey-balsamic sauce. One of France’s oldest cheeses, the Fourme d’Ambert had a milder blue cheese taste. Baked in this tourte with a thick bechamel sauce, the result was wonderfully nuanced and yet apparently simple. Definitely greater than the sum of its parts. I’d take this over a cheese course any day. Onto desserts, the first dessert was a pistachio rice milk, lemon pound cake and coffee chantilly. Honestly, this dessert lost me. Texturally, the pistachio rice milk and the coffee chantilly were similarly soft and mousse-like. It’s like a dessert that could have been good had been pureed into the texture of baby food. This was the only dish that we left partially eaten. I’ll put it down to bad code in the food replicators. We finished with the chocolate mousse with coconut sorbet soup and rum bananas. The photo doesn’t do this dessert justice. Yes, it looks like a bowl of melted ice cream but the chocolate mousse had a distinct kick of jalapeno in its tail, which was soothed by the coconut sorbet soup. So there it was. The end of another LudoBites adventure. It’s hard not to make comparisons with LB 2.0. Sure, there were dishes I missed. But there were also dishes here I’d definitely add to a “best of” LudoBites menu. But ultimately, LudoBites 3.0 held out the promise of further exploration and experimentation when Ludo returns with version 4.0 and eventually his bricks and mortar dream. And I’ll be there as eager as I was for this incarnation. Until then Chef Ludo, live long and prosper. LOVE the Ludo/Spock photoshop! Did you do that yourself? Dude, your writing is as good as your pics. Very funny. Happy to share food communion with you any day, brother. HAHAHAHA I love the Ludo Spock…. omg. you are so funny. beautiful review, beautiful snaps. hugs and HNYE to Amy.